We've just heard from AT&T that new carrier settings for the iPhone 3G and 3GS will be available "late morning" Pacific Time (which would be early afternoon Eastern) this Friday, September 25, which will finally enable MMS support. Owners will have to tether up to iTunes to grab those settings, so fish out your cable (as if you don't have it permanently attached to your machine already) and make sure you've got some solid time in front of the computer to check for the update over and over (and over) again, alright? 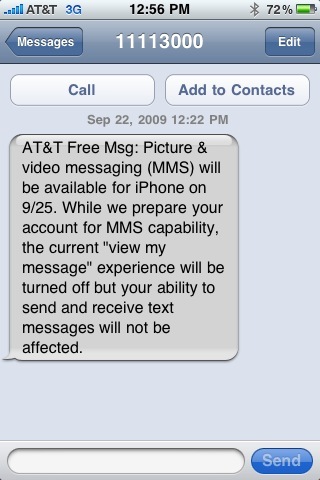 AT&T slips some iPhone MMS rollout details for Friday originally appeared on Engadget Mobile on Wed, 23 Sep 2009 15:48:00 EST. Please see our terms for use of feeds.